To Cite: Keskin S, Keskin Z, Gunduz M, Sekmenli T, Kivrak H Y. Gangrenous Appendicitis in a Boy with Mobile Caecum, Iran J Radiol. 2015 ; 12(2):e11076. doi: 10.5812/iranjradiol.11076. A mobile caecum and ascending colon is an uncommon congenital disorder, and it is even rarer as the cause of an acute abdomen during childhood. 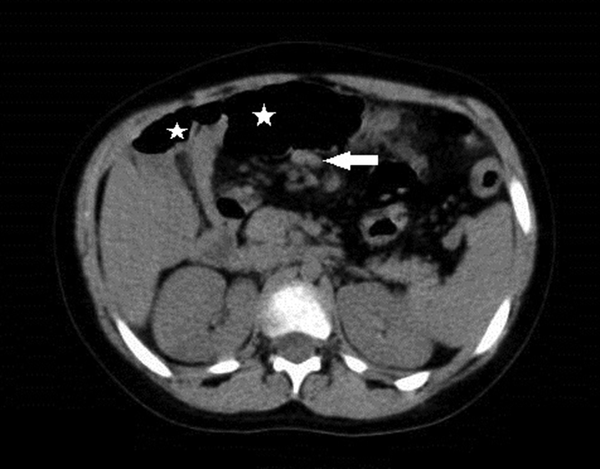 This report presents the case of a 6-year-old boy with acute gangrenous appendicitis with a mobile caecum and ascending colon. Data from the surgical course, as well as laboratory and imaging studies, were acquired and carefully examined. Emergency ultrasound (US) was performed and revealed no signs of appendicitis in the right lower quadrant. Serial imaging study, including non-enhanced computed tomography (CT), was performed. An imaging study identified epigastric appendicitis with mobile caecum. Surgery was executed under general anesthesia with a median incision extending from the epigastrium to the suprapubic region. The caecum was mobile and placed in the right epigastric area, next to the left lobe of the liver and gallbladder. The gangrenous appendix was discovered posterior to the caecum and transverse colon, enlarging to the left upper quadrant. Appendectomy was executed, the gangrenous appendix was confirmed pathologically, and the patient was released 4 days later. 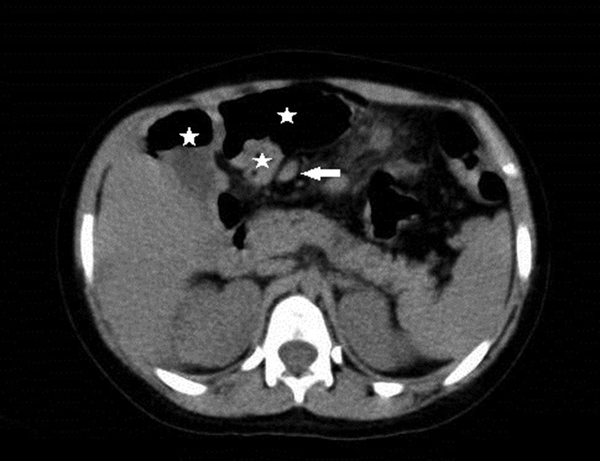 In the US, if there are unusual clinical findings or no findings in patients with abdominal pain, CT is beneficial in determining the location of the caecum and appendix and preventing misdiagnosis in children. Appendicitis, in which surgical intercession is needed, represents a frequent cause of acute abdomen. In fact, it has been identified as one of the most common causes of acute abdomen in the world (1). A mobile caecum is an uncommon congenital disorder, but may also very rarely cause acute abdomen in childhood. Embryologically, the posterior peritoneum commonly covers the caecum and ascending colon, in the retroperitoneal space. However, this usual occurrence may vary very often. A mesentery that permits the colon to openly rotate may postpone the attachment of the caecum and ascending colon. This is an uncommon birth defect that is usually observed during childhood (2, 3). Normally, a diagnosis of acute appendicitis is accurate when clinical history, physical examination, symptoms, and laboratory findings are taken into account. However, due to the abnormal position of the appendix, radiological methods play an important role in the preoperative diagnosis and the identification of appropriate treatment in patients with atypical clinical features (3, 4). The aim of this paper is to assess the radiological and clinical findings of acute appendicitis in a boy with an atypically placed caecum. The emergency departmaent admitted a 6-year-old boy with abdominal pain to our hospital. The pain, which had continued for a week, was most intense in the right upper area. Vomiting, fever, and nausea attacks were noted to continue over 12 hours. Physical examination showed tenderness in the suprapubic region with rebound tenderness. In laboratory tests, an elevated white blood cell count (28100 / µL) was observed. In the right lower region, no signs of appendicitis were found on ultrasound (US). However, US revealed an amount of free fluid around the intestines. An abdominopelvic computed tomography (CT) examination without intravenous or oral contrast material was performed for differential diagnosis (Somatom Emotion Duo CT, Siemens, Berlin, Germany), with the following scanning parameters: 0.6 mm collimation, 5 mm slice thickness, 1.4 mm increment, 100 kV, and 135 mAs, a pitch of 0.9, and a gantry rotation time of 0.33 s. From axial CT images, the caecum and ascending colon were found to be absent on the right side of the abdomen. The caecum was located in the epigastric area, adjacent to the left lobe of the liver and gallbladder, (Figures 1-3). 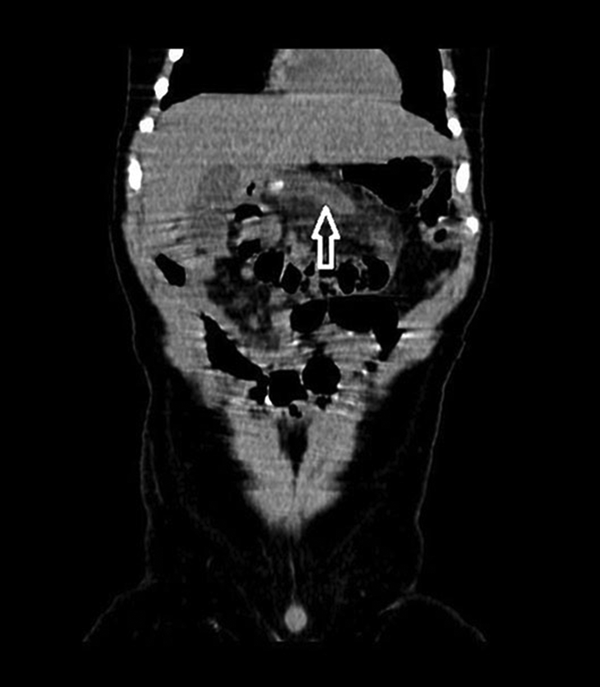 A cylindrical mass of approximately 8 cm in length and 16 mm in diameter that extended to the left upper quadrant described an appendicitis tableau situated posterior to the caecum and transverse colon (Figure 4). The wall of the appendix was thickened and an appendicolith was present in the proximal appendix. In addition, periappendiceal fat standing suggested inflammation. Multiple lymph nodes were identified around the appendix. An upper right paramedian incision was performed under the general anesthesia. The surgeons found that the caecum was mobile and situated in the epigastric region (Figure 5). The surgeons performed the appendectomy, and the appendiceal specimen was sent for pathological examination, the patient was discharged 4 days later. Figure 1. A 6-year-old boy with one week history of abdominal pain and tenderness, leukocytosis, and free fluids around intestines in sonography. Axial CT image demonstrates the caecum (white arow) located in the epigastric area adjacent to the left lobe of the liver and gallbladder. The wall of the appendix is thickened, and an appendicolith (black arrow) is present in the proximal part of the appendix. Figure 2. 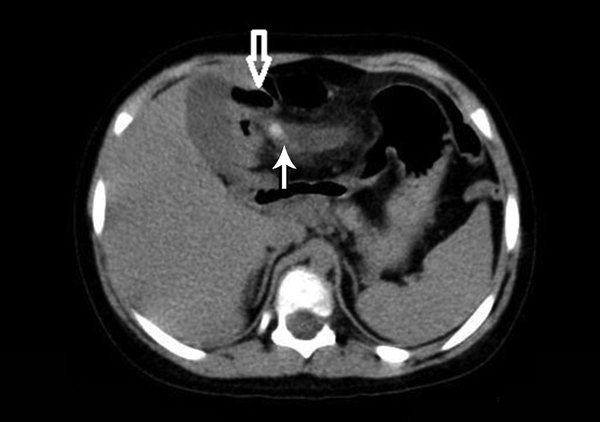 Axial CT slide demonstrates the caecum (stars) and terminal ileum (white arrow) located in the in the epigastric area adjacent to the left lobe of the liver and gallbladder. Figure 3. Axial CT slide demonstrates the caecum (stars) and terminal ileum (white arrow) located in the in the epigastric area. Figure 4. Coronal multi-planar reconstruction (MPR) CT slide demonstrates a tubular structure of 16 mm in diameter (white arrow), posterior to the left lobe of the liver, surrounded by inflamed mesenteric fat. Figure 5. During the operation, the caecum was found to be mobile and located in the epigastric region. At the bottom of the caecum, a gangrenous appendix was demonstrated. The appendix is located on the posteromedial side of the caecum, at approximately 3 cm below the ileocecal valve (5). There is an invariable connection between the bottom of the appendix and the caecum, but the free end of the appendix is mobile, which accounts for its variable location in the abdominopelvic cavity (6). A mobile ascending colon and caecum are uncommon reasons of acute abdomen (7, 8). In embryogenesis, the failure of the right colonic mesentery to fuse with the lateral peritoneum occurs because of this abnormal feature. Therefore, the ascending colon and caecum are unassociated and can revolve freely. In spite of this, the ascending colon and caecum commonly have a normal anatomic condition (9). This may be described as the likely cause of normal US and barium studies in this patient. The US exhibits high specificity and sensitivity in the diagnosis of acute appendicitis. Nevertheless, in US examination, a mobile caecum may be misdiagnosed as Meckel’s diverticulitis, duplication or mesenteric cyst, infected urachal cyst, or sigmoid diverticulitis (10). The most common congenital anomaly of the gastrointestinal system is Meckel’s diverticulitis (11). In the general population, duplications of gastrointestinal tract are uncommon (12). The mesenteric cysts that are found within the abdomen are benign lesions, with an incidence of less than 1 : 100.000 cases (13). Diverticulitis, which is the most common complication of diverticulosis, is defined as the inflammation or infection of diverticula. On average, 20% of cases are symptomatic (14). In our case, US examination did not show the appendix. On CT examination, the position of the caecum and ascending colon were shown to follow the enteric sections sequentially from proximal to distal. In the literature, Toprak et al. reported two cases of mobile caecum with acute appendicitis in adults. They found that the right hemicolon and caecum were located in the left upper quadrant, adjacent to the splenic flexure and descending colon (15). We found that the caecum was located in the epigastric area, adjacent to the left lobe of liver and gallbladder. Printen et al. and Makama et al. reported several mobile caecum cases in adults (3, 4). Makama et al. found an abnormal position of the caecum and ascending colon in barium study. They did not observe abnormal findings on abdominopelvic US (4). In contrast to their case, we found acute gangrenous appendicitis in a child, extending laterally to the left upper quadrant. When there are atypical clinical findings and no US findings in patients with abdominal pain, the CT is beneficial in helping to recognizing the situation of the appendix and caecum, and to prevent misdiagnosis in children. We thank Professor Ahmet Yesildag for his valuable contributions to this case presentation. Authors’ Contributions: Suat Keskin, Zeynep Keskin, and Metin Gunduz diagnosed the patient and prepared the case report. Taner Sekmenli and Hatice Yazar Kivrak helped with the diagnosis.